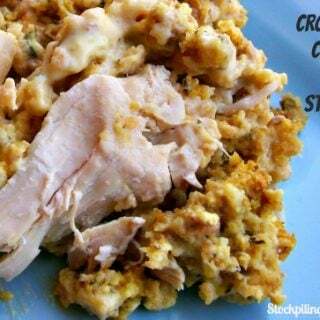 Crockpot Chicken and Stuffing is so easy to make with only 4 ingredients and a slow cooker! 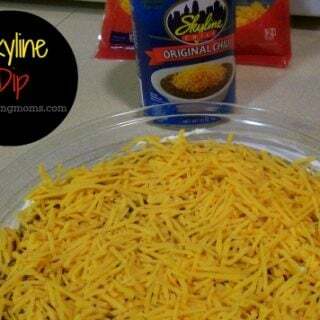 My family loves this easy dinner recipe! I love how easy it is to prepare! They always ask for more when I serve this for dinner. 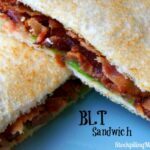 That’s right this recipe has only 4 ingredients, that you probably already have in your pantry like I did. 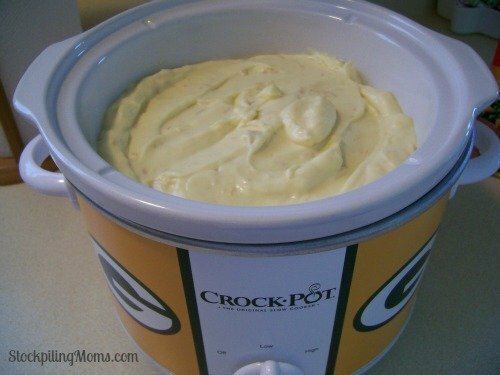 For Mother’s Day I got a brand new Green Bay Packers Crockpot and I was excited to use it. So I started looking up crockpot meals and found this one. I had all the ingredients on hand so I went to crockin’! All you need for this one dish meal is boneless chicken breasts, Stove Top Cornbread Stuffing, can of cream of chicken soup and sour cream. 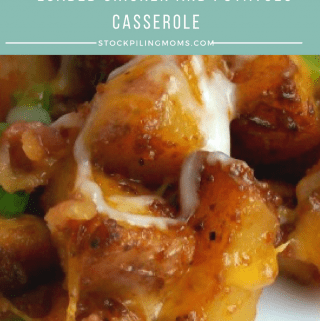 My family loves this dinner recipe! I love how easy it is to prepare! They always ask for more. Remember that all crockpots vary in cooking times so always start checking it after 3 hours. 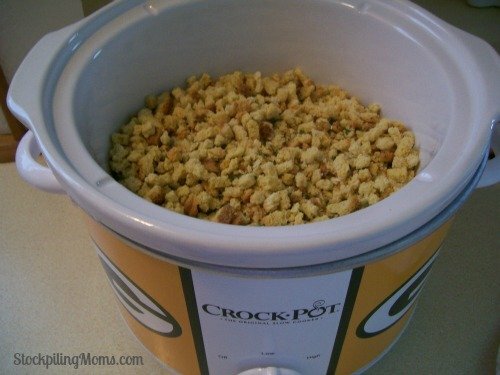 You place the chicken breasts in the bottom of the crockpot and pour stuffing mix on top. Next you mix the can of cream of chicken soup with 1/2 cup sour cream and 1/4 cup water, then place on top of the stuffing. Pour on top of stuffing mix. 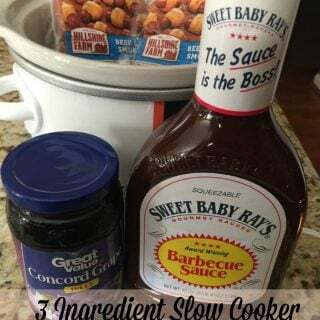 Place lid on crockpot and cook on low for 4 hours (check it at 3 hours). Fluff and serve. 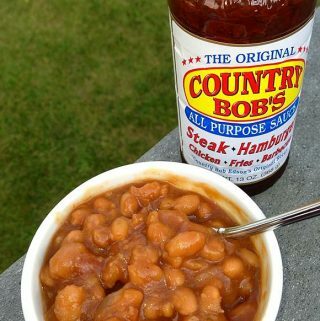 I like to serve this with green beans and mashed potatoes. 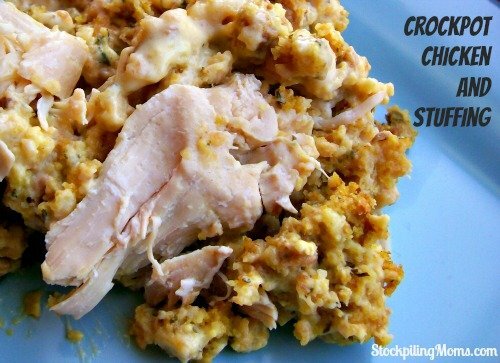 I hope you enjoy this delicious Crockpot Chicken and Stuffing as much as we do! 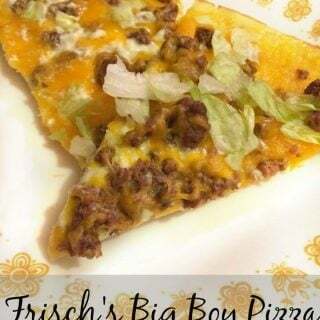 It is soon to become a family favorite once you do. 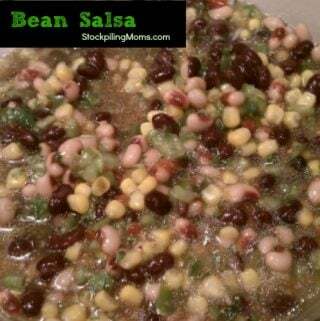 This is an excellent one dish meal that you make in the crockpot! 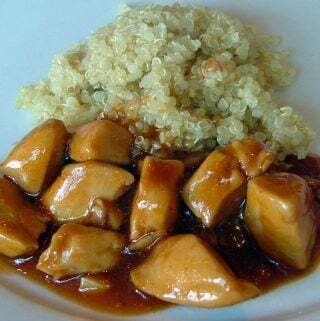 Place chicken breasts in bottom of crockpot. Pour stuffing mix over chicken. In a medium size bowl combine cream of chicken soup, sour cream and water; mix well. Pour on top of stuffing mix. Place lid on crockpot and cook on low for 4 hours (check it at 3 hours). Can I make this with cream of mushroom soup instead of cream of chicken?? Yes you can! Or Cream of Celery would work too. It doesn’t tell me how I would convert this recipe from 4 hours on low to how long on high? 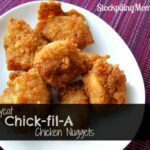 Can I use 4 drumsticks instead of chicken breasts? I would guess that it would take 2-3 drumsticks to equal 1 chicken breast. Boneless Chicken Thighs might be a better choice though. You can use instead – 1 cup yogurt, plus 1 tablespoon flour, plus 2 teaspoons water. I didn’t use sour cream because I didn’t have any on hand, and it was all right. I did add about a quarter cup of chicken broth to the canned soup. The dish turned out fine. Have you tried this with frozen chicken? I am not sure I took my chicken out of the freezer in time. Hungry for some comfort food and this recipe looks like it might hit the mark. Although made in a Green Bay Packers crock pot, it will taste infinitely better in a Philadelphia Eagles slow cooker! (Thanks for posting it and for taking a little “ribbing. 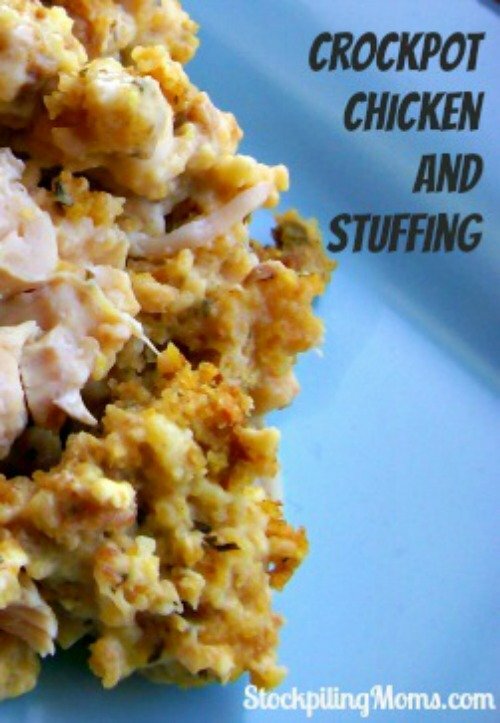 !”) S.
So, I made this last weekend and it was delicious (chicken and stuffing). As I am a one-person household, I cannot tell you how nice it was to come home after a long day at work (office) and have this to pull out and reheat. 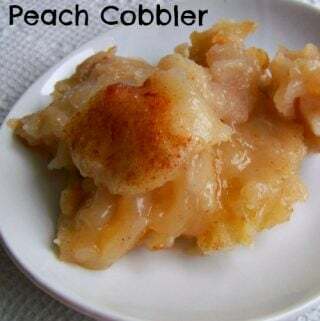 Yummy and thanks for sharing this recipe. Looking forward to the 2015 NFL season which begins Sept. 17th — are you ready for some football? 🙂 Thanks again…..S from Sacramento, CA (a Philadelphia transplant!) Go Eagles! That would be a “Steelers” Crockpot for me!!! how ong does it take to cook if schiken breasts are frozen? By fluffing do you mean stirring? Yes, with a fork. Fluffing up the stuffing. Do you need to use the cornbread stuffing or could you just use any stuffing? Thank you for this great recipe! I am collecting crock pot meals that only require 5 or less ingredients because it helps so much on busy mornings to just dump things in a run out the door. This is a great addition to my collection! One question… I usually get meals started in the morning and we don’t eat dinner until 6pm. 4 hours for cook time is on the short side for me… it will probably be left on warm for another 4 hours. Do you think that will work okay? I am afraid it would dry out the stuffing on this one. If I wanted more stuffing, should I just double the water (and stuffing) or add more soup too? I would double the stuffing/water/soup. In the crock pot as we speak, should be ready for kickoff. I am a little confused, however. 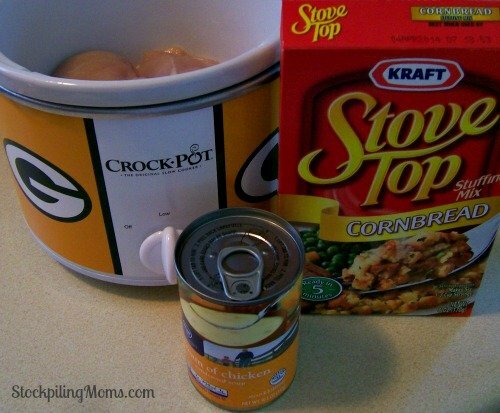 how do you make something in a Green Bay Crock pot without any cheese in the recipe? 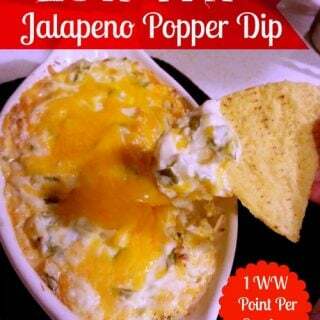 I have this in my crockpot right now but I set it for 4 hours on High. I think the Low setting would be 6 to 7 hours. Has anyone thoroughly cooked their chicken on low in four hours? I did check other similar recipes online and most said high for 4 hours so here’s hoping this turns out well as I want to make it for company next week. I made it and found it to be very bland. The next day I added sautéed chopped celery and onions with salt, pepper, and a shake of garlic powder and it was amazing. Has anyone tried this w/ low fat or fat free versions of the ingredients? No, we haven’t but I bet it would work! Can I use chicken stuffing instead of cornbread and would it be okay to double the recipe in a bigger crockpot with the same yummy results? Instead of the sour cream because I didn’t have any and wasn’t running to the store at 10 o’clock at night, I used a chicken gravy packet and 3/4 cup of water instead of the 1/4. It turned out great. I also used Cream of Mushroom instead of chicken. Turned out delicious. Have you tried putting frozen vegetables in it? Yes – green beans and it works AWESOME! Frozen broccoli works great also, just run the package under cold water for a few moments to break it up a little bit so you can spread it evenly in the Crock-Pot? 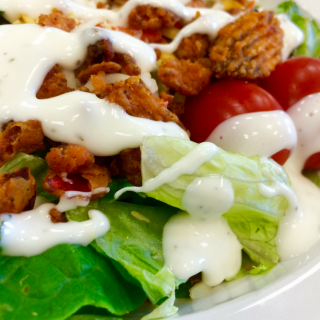 Would mayo work instead of sour cream? Actually greek yogurt is a great substitute! Can we use chicken broth instead of water? Would it be all right to cut the chicken up before putting it in the crock pot? Also, I’d like to make about 6 servings, so I will just add more of everything. This recipe is very good, but found the chicken breast to be a little dry. When I made it the second time I used skinless boneless chicken thighs and found it to be much better. Can I use the bagged brown berry stuffing instead of stove top? How many pounds of chicken in your recipe? Should not be a problem! 2 lbs. I like to always cook my chicken beforehand amd shred it. I wonder if i mix all of these ingredients together with the shredded chicken will it come out ok? Unfortunately, this recipe was a huge fail. I used frozen chicken, and after 4 hours, the chicken was still frozen and the stuffing that maneuvered to the bottom, burned. Thankfully I used a liner. I’ve pulled the chicken, removed the liner, and now am trying to finish cooking the chicken in some vegetable stock and cream of mushroom soup. I looked forward to this, but it failed. Trying to salvage it. You should not use frozen chicken for this recipe. Do you think it would work if I mix this all up and put it in the frig in the morning and have my husband take it out and turn it on at noon? I am not sure as it might get too mushy? How about adding in frozen corn with some frozen green beans? Frozen is no problem. It will add a little more liquid as a it cooks though. I’m cooking this right now. It’s been cooking about 2 hours and all the soup/sour cream/water is still setting on top is that what it’s supposed to do? I figured it would sink into the stuffing. I would stir it up well! 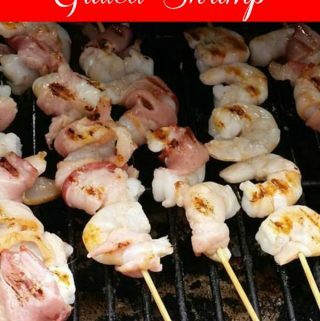 This recipe is very versatile and easy to switch ingredients for different tastes and styles. 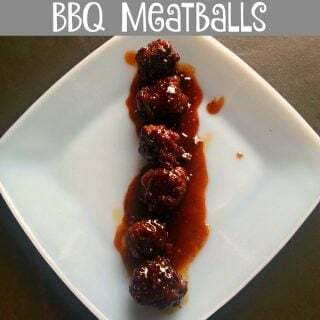 It’s an all around recipe any one can style and flavor to their families favorites. Is it necessary to use sour cream? Can I use mayo instead? I think you could use greek yogurt, cream of chicken soup or mayo instead.